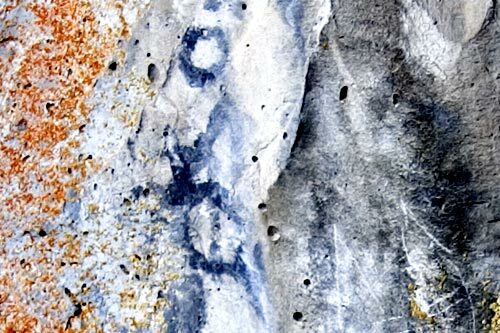 Big Painted Cave and Symbol Bridge - Explore! 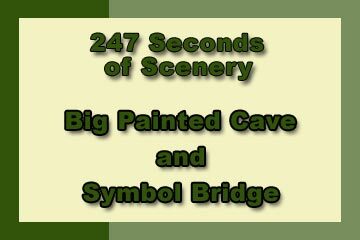 Big Painted Cave and Symbol Bridge - Explore! Lava Beds National Monument . . . The trail to Big Painted Cave and Symbol Bridge was the backbone of my explorations in this area southeast of Schonchin Butte in the Lava Beds National Monument. The trail heads toward Schonchin Butte from the road to Skull Cave. 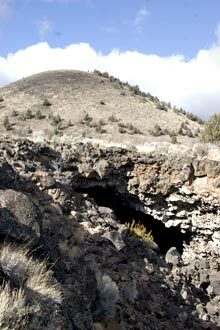 The Skull Cave Road is about 1.3 miles northwest of the monument Visitor Center on Hill Road and heads eastward. There is a small parking area and a trail sign at the trailhead. 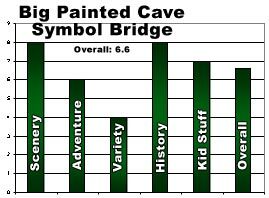 It’s about a mile walk to Symbol Bridge and you will pass Big Painted Cave along the way. There are signs and interpretive panels to provide orientation. The trail itself is well constructed and smooth – with the exception of a few low stair-steps. The main trail could be traversed in a wheelchair, but the trails down into these two features could not. The trail parallels the same lava tube that formed Skull Cave. You can learn more about exploring Skull Cave from an earlier article and you may want to include Skull Cave during your visit to make this a larger adventure. 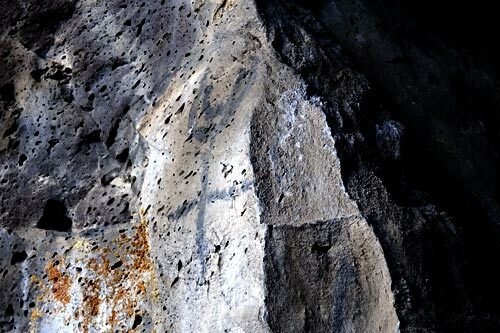 You will see several ‘cave-ins’ where the roof of the tube has collapsed leaving segments of large trenches or what appear to be craters littered with broken rock. You will also be crossing over the tube at a place where the tube appears to be intact, but is blocked at both ends by rock. You can see the trail, a segment of the road and the route of the lava tube in the photo above. While it may not be immediately obvious, there is a trail down into Big Painted Cave. It starts near the interpretive panel and navigates through the rocks and over uneven stair-steps. It ends at the back of the cave. The cave has a wide mouth and an oblong interior. You will be standing about 50 feet below the surface at the back of the cave. 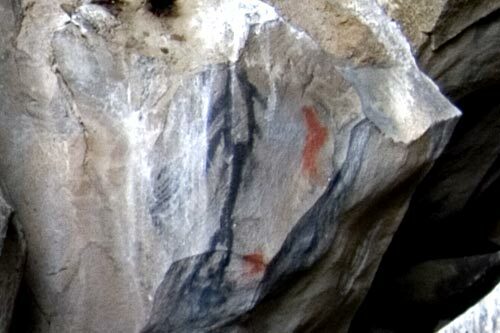 There is plenty of sunlight, even at the back of the cave, but a flashlight will be helpful in finding the rock art. 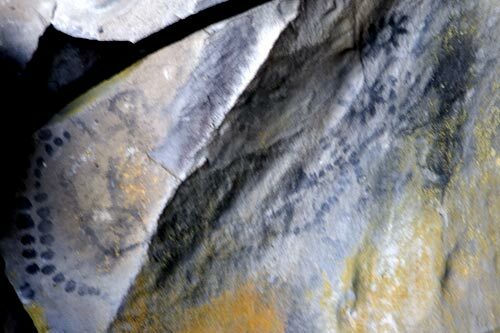 I was disappointed with the rock art at the cave. 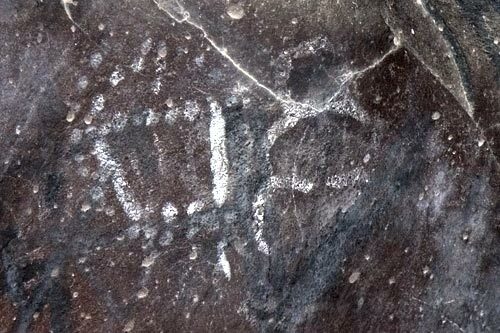 Much of it had been obviously vandalized and the remainder was faint and difficult to discern. This is partly due to the effects of water and animals and the age of the paintings. A raptor that has built it’s nest on a ledge high on the cave wall is not careful about where it makes its deposits. In addition, pretenders seem to have added their own rock art. 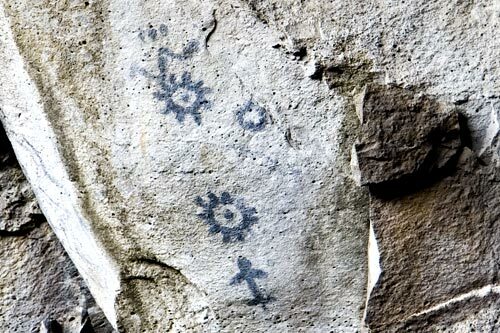 Because the Park Service asks visitors to stay on the trail in the cave, it is not possible to get among the boulders to have a good look at the art found there and on the more distant walls. I suspect the cave was named more for its colorful green lichens and red rock than the artwork on the walls. The trail ends at a opening in the floor at the back of the cave. If you are skinny and adventurous enough, you may be able to squeeze and crawl through it to find a small ice chamber. This is not a natural opening. Explorers dug out the rocks to create the opening in 1917. I can’t attest to the presence of ice in the chamber, but there was some very cold air coming out of it. 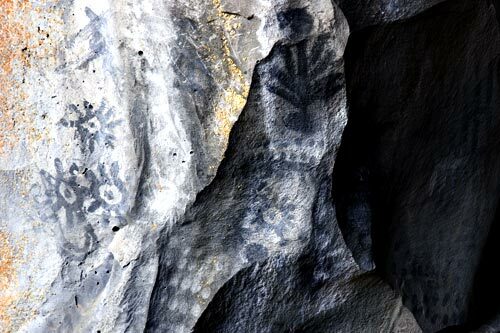 After exploring Big Painted Cave, I continued on the trail to Symbol Bridge. A “bridge,” to lava tube experts, is a section of lava tube roof that remained standing between collapse trenches. It is, basically, a bridge that spans a collapse trench. That’s what we have at Symbol Bridge. From above, the opening looks like a typical lave tube cave. Once on the floor of the collapse tube, however, you will be able to see through to the other side of the bridge. The trail to the bottom of the trench is similar to the trail at Big Painted Cave, but a little easier to traverse. Like Big Painted Cave, the deepest part is about 50 feet below the surface. 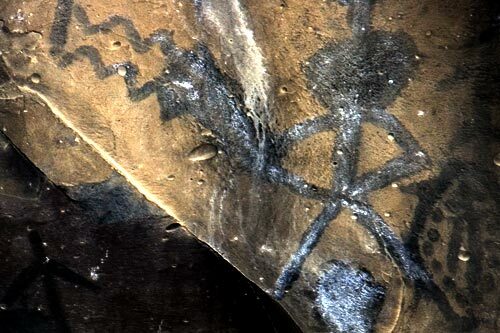 Unlike Big Painted Cave, the rock art here is bright, bold, obvious and well-preserved. 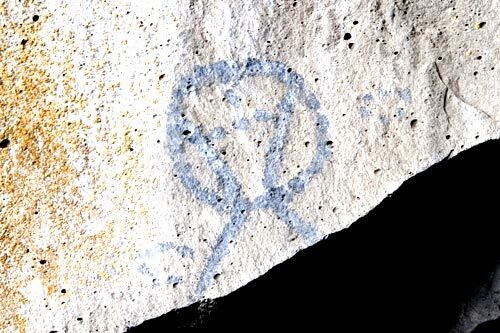 Local Native Americans have stated that the art work is very old and they generally are unaware of particular meanings associated with the pictographs. Sit on a rock and contemplate the artwork. It’s easy to invent meanings for each piece, but it’s helpful to remember that the ancient people had a different point of view. Those that painted are believed to have done so from a spiritual perspective, sometimes associated with visions for which they quested. Thus, the paintings may mean something only to the painter and the viewer is left to create a new meaning – or no meaning at all. Rather than trying to describe the art, let me offer a slide show to give you the general idea. The video provides additional context. I rated this place highly for scenery. It’s not the wide open western views that one can be generally seen in this area, but the mid-ground views of Schonchin Butte in contrast to the foreground views of broken lava and deep trenches. At the end of the trail and under the bridge, you are a mile or more away from any form of civilization. With the addition of a trek into the ice chamber of Big Painted Cave, it can be a greater adventure. 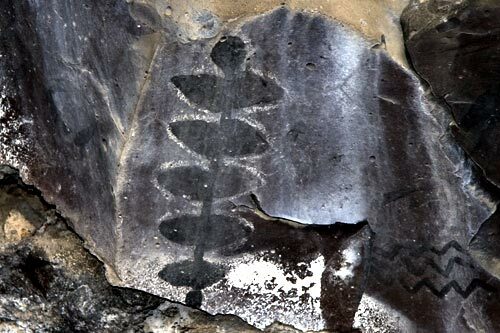 Variety is presented in the combination of trail, trenches, cave, bridge and pictographs, but there is no water and little in the way of vegetation. 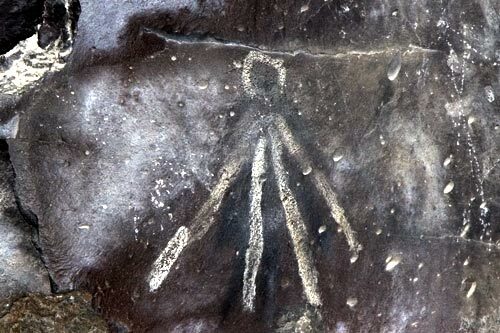 The real story of this place is its pre-historic use as a spiritual center. 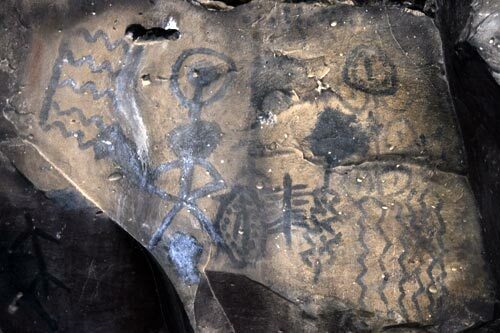 The rock art at these two features attests to their importance to the Native Americans of the area. It is also a good adventure for kids. The trail is fairly easy and the prize – Symbol Bridge – is at its end. The aerial view is courtesy of USDA Farm Service Agency. Titles were added by Jerry Haugen. All other photos, text and video by Jerry Haugen, Explore Pathfinder. Jerry also shot the video and performed all post production work. All materials are ©2010 Global Creations LLC, All Rights Reserved. What a good site. It is very helpfull for me to explore this summer the monument en the others things in Oregon..